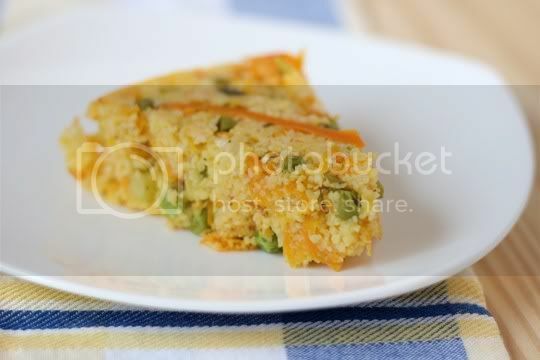 The quintessential American combination of sweet peas and carrots pairs wonderfully with savory polenta and Parmesan in this light yet filling springtime dish. It's also gorgeous to look at, and would make a beautiful addition to your Easter or even brunch table. You'll need a little artistic flair to create this dish. 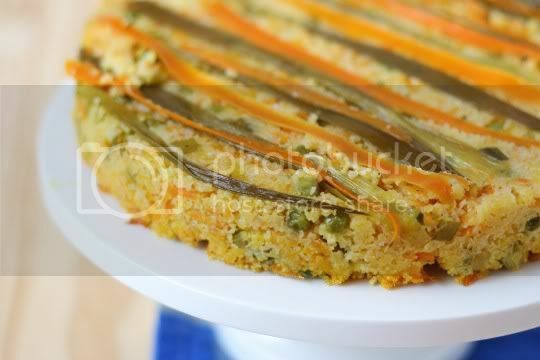 It starts off similar to an upside-down cake: layer strips of peeled carrots and green onion in a pan before you fill it with the polenta mixture. Make sure you spray the pan with oil liberally, otherwise your galette will stick. The amounts suggested for the "topping" are a bit off. 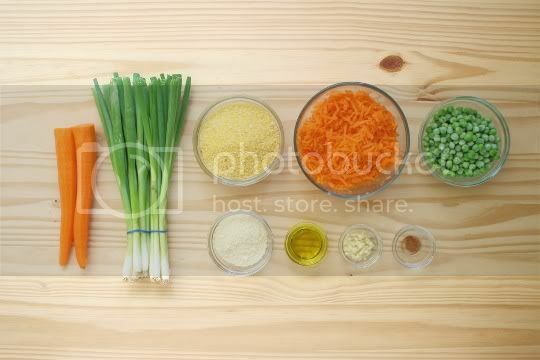 You really only need one carrot and maybe 5-6 green onions, instead of the two carrots and entire bunch of onions mentioned. Unfortunately I didn't realize this until after the fact, so all of my extra green onions went into the mixture (more on that later). 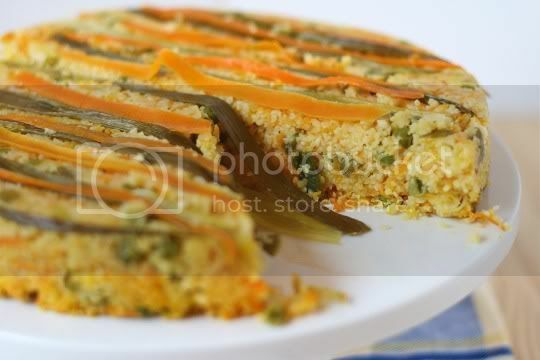 Once the pan is prepared, cook the polenta, then stir in the remaining green onions, grated carrots (I used 3), peas, Parmesan, olive oil, garlic, and nutmeg. Season to taste with salt and pepper, mix everything together, and pour it in the pan. I had to bake mine longer than the suggested time (about 15-20 minutes more) to achieve lightly browned and crisp edges, so just a heads up. Unmolding the galette is pretty simple, as long as you've let it cool for at least 10-15 minutes post-baking to allow it to set. Just place a large plate or platter (I used a cake stand) on top of the pan, flip it, tap the bottom of the pan a few times, and you'll feel the galette plop right out onto the plate. I had a few carrot and green onion strips that got stuck to the pan, but I simply removed and reapplied them. Cutting this into wedges may be a bit difficult, as the topping strips may start moving all over the place, so use a sharp, serrated knife for best results. And even if the wedge doesn't hold together (as a few of mine didn't), this is still delicious piled into a bowl. The flavors are light, but the polenta keeps the dish hearty. 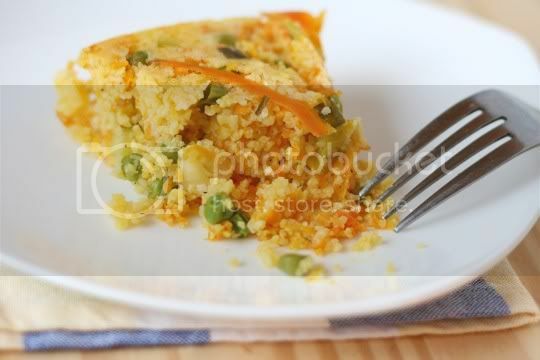 Each bite is moist and tender, with sweet carrots laced throughout and bursts of sweet, juicy peas. The Parmesan serves as more of a background flavor, which is why you will need to make sure you salt the mixture to taste before baking. In fact, I'm not sure the dish really even needs the Parmesan, so you could easily make this vegan. As I mentioned before, I used all the additional green onions I had leftover, which made this dish very pungent and oniony...and that's on top of the heavy garlic flavor. I'm not saying that's a bad thing, as the final product is still very good, but you may want to consider buying two entire bunches as suggested. Make again? Yes. Pretty to look at, and tasty to eat! Vegan variation: Omit Parmesan, or use a vegan version (such as Parma!). Yummy! This kind of recipe is what inspires me to be vegan. Who needs meat when you can eat this kind of food. this looks so good, thank you for sharing your recipe. What temperature does one set the oven for, when baking? Thx! Check the recipe link at the bottom of the post, it's 375F.